"Banner of the Chinese Catholic Association"
Banner of the Chinese Catholic Association (Zhonghua gongjiao jinxinghui 中華公教進行會). 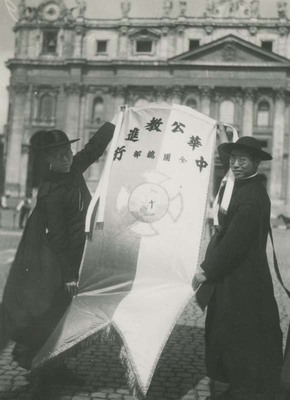 Banner of the Chinese Catholic Association. June 11, 1933. Société des Auxiliaires des Missions (SAM) China Photograph Collection, Whitworth University Library, Spokane.